1Lt Kenneth E. Bixby (P) - Was Pilot on all of the crew's 39 dispatched missions. 2Lt Clayton C. Jones (N) - Flew with other Pilots on 9 missions (279, 280, 294, 298, 303, 311, 315, 318, 319). Substitute Navigators used on 11 missions (278, 281, 288, 316, 324, 332, 333, 335, 336, 337, 339). Combat tour completed on 18 March 1945. T/Sgt John B. Robichaux (E) - Flew with another Pilot on one mission (294). Substitute Engineers used on three missions (276, 296, 339. Combat tour completed on 18 March 1945. S/Sgt Leland Krumwiede (R) - Flew all of his missions with Lt Bixby. Substitute Radio Operator used on two missions (304, 339). Combat tour completed on 18 March 1945. S/Sgt Dale G. Reese (BTG) - Flew with other Pilots on three missions (294, 298A, 331). Substitute BTG used on five missions (272, 335, 336, 337, 339). Combat tour completed on 10 March 1945. Sgt Mondo Lombardi (WG) - Flew on ten missions with the Lt Bixby crew (271, 273, 274, 275, 276, 277, 278, 281, 282, 283). Was then removed from combat status. 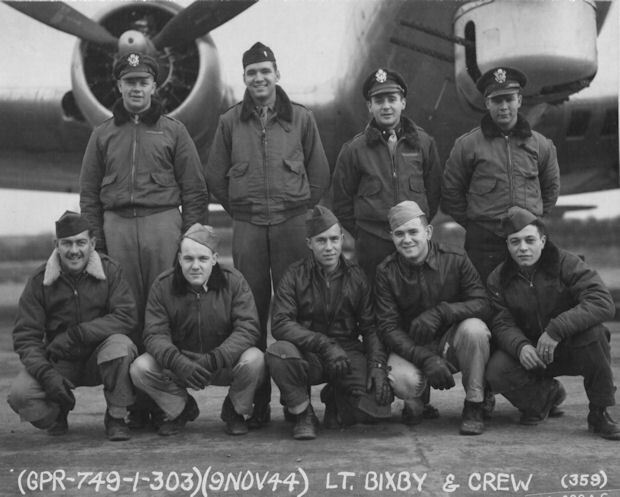 Was replaced by S/Sgt Joseph R. Erdody (WG) who flew with LT Bixby on thirteen missions (285(A), 286, 289, 290, 292, 293, 295, 296, 301, 302, 304, 309, 310). Substitute Waist Gunners used on six missions (272, 287, 288, 298B, 316, 317). Flew with other Pilots on 23 missions - twelve with the Lt Phillip H. McDavid Crew. S/Sgt John W. Peters (TG) - Flew on 33 missions 271 through 326 with the Lt Bixby crew. Flew with other Pilots on four missions (284, 297, 318, 331), Substitute Tail Gunners used on six missions (332, 333, 335, 336, 337, 339). Combat tour completed on 7 March 1945.